Mfg. 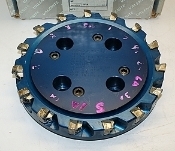 : Valenite, Cutter: 43-724-3421, Condition: Very Good , Dia: 8-1/2", No. of Stations: 15, Insert: ESU-13293 1T5 (included), Arbor Hole: 2 1/2", Keyway on back of cutter: 3/4", Keyway behind plate: 1/2". There is a face plate that covers the cutter, and is held down via 4 smaller screws - Large Bolt holes are 3" on Center , Body: Aluminum , The Diamond Inserts in Good Conditon. Spare tooling for the Chrysler 3.3L V-6 OP 20 Cylinder Head. Other markings on Cutter: TL# 4621511-F-1082 FX-169431-1, M1006628, Manifold: 92-724-0010. Made in USA. Perfect for OEM and aftermarket machine shops, engine rebuilders, etc. That's the original factory finish.